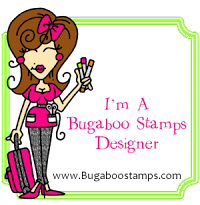 We are on the last week of Christmas in July at SweetStamps.com and our focus is on Parchment Stamping. I created using Silver Bells : ) If you start singing Silver Bells it will make me smile : ) I stamped the image Bells with Bow onto Parchment Vellum. First, use an antistatic pad! 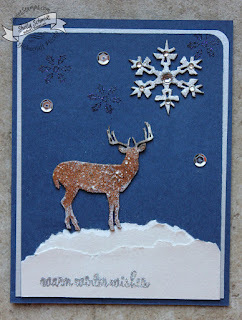 Using embossing ink, I achieved this twinkle using Ivory Fantasy EP. I fussy cut out the Silver Bells. I colored in the back and a tiny bit on the front of the Vellum with Copic (Sketch) markers. I added some piercing and I embossed from behind on the round bell portion and added Sakura Gelly Roll pen so it would really sparkle. I embossed the image Scroll Scissors Frame (also) using Ivory Fantasy EP. I fussy cut the edge of the image and also cut out the oval from the inside. I added dots of G18 Copic (Sketch) marker on the dots around the edges. I popped up the red layer on dimensionals, I had red cardstock behind the oval, but decided to soften the look by adding (Parchment) Vellum on it. Finally, I embossed Merry Christmas and added it to the front of the card. 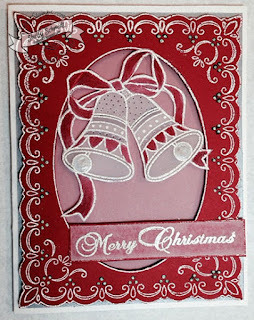 I layered the red top layer over a Metallic Silver cardstock (from SU), then an Ivory shimmery cardstock from Paper Temptress. We hope you will JOIN us in the challenge!!! HERE is the Challenge Blog. 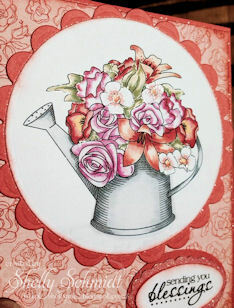 HERE is the SweetStamps video showing how easy Parchment is- such a beautiful look! I have friends that recently had a loss, and I wanted to make them a card. I thought this floral bouquet- which is a precolored digi from Sparkle and Sprinkle was beautiful and decided to use it for my card. This view shows some of the sparkle. The sentiment, by Create with TLC, has an oval that I covered with Sparkle and Sprinkle Cloud Nine Velvet Glitter behind it. I added additional shimmer using a Sakura Gelly Roll pen. The cardstock is SU Groovy Guava. We are still creating Christmas Cards in July at Sweet Stamps, and this week we are creating using snowflakes or Snow somewhere on your card. 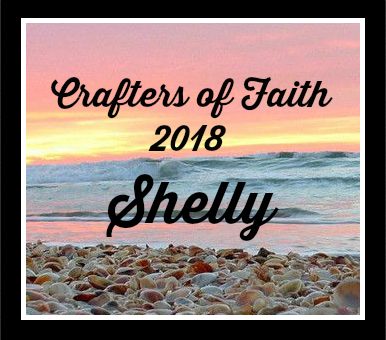 I had such fun creating this card! I was aiming for a CAS look, especially since I mail all of my cards and wanted to avoid additional postage The White cardstock is from Paper Temptress, and was torn to make the snow. I stamped the sentiment using Sparkle Silver EP. I used Gilding flakes on the big snowflake using Duo Glue. I added the embossed snowflakes using Holographic EP- it is a cool look! I added sequins and rhinestones for a final accent. The deer is embossed using Aged White Enamel EP and Brownstone EP for the body. First, use the antistatic pad, and the Enamel Adhesive dauber is used to prepare the deer chipboard for embossing. I colored with Copics- pretty CAS since it had to be put in the mail. I added sequins for bling and twine over sparkly silver CS for a little accent. 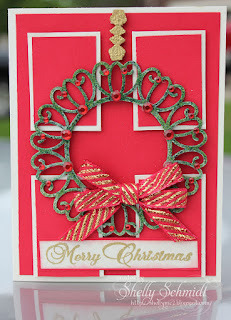 The Sweet Stamps challenge to use Traditional Christmas Colors. And, what could be more traditional than Red and Green. I had fun making this card- I have seen many versions of a wreath on a door, and I thought this Globecraft Piccolo Classy Circle Frame would look great as a wreath. I used Mossy Glen Enamel EP on the frame/wreath. I added Red Rhinestones on the frame. The wreath hanger is from the GP Braided Border set- from a waste piece of the borders. I used the center (waste) piece of the set and cut it down, then embossed it with the 24 K Gold Enamel EP. (look between the braids). I embossed it twice- and TIP- make sure the embossing is totally cool before you apply the next layer of Enamel EP Adhesive. The Merry Christmas sentiment was also embossed using the 24K Gold Enamel EP. The ribbon was white and gold- and I used Copic Sketch markers R37 and R39 to color over it and turned it Red to match my Traditional Colors card. Lots of new babies recently : ) I had fun using an image and sentiment from Create with TLC. Nice and CAS for me too : ) The image is colored with Copics. 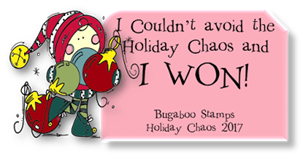 We are making Christmas Tags for the Sweet Stamps challenge this week. I was playing with Color Bursts again, and decided to emboss a Christmas Tree on on of the green panels in Globecraft-Piccolo 24 K Gold Embossing Powder- so pretty IRL! I fussy cut the tree and went to work making a background for it. I embossed the swirls on the background with Fine Detail clear EP. I used distress inks Festive Berries and Tea Die, added a touch of Rust then added Wild Honey. 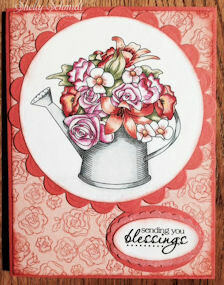 I used 2 of the new 3 x 6 stencils at Sweet Stamps- Backsplash and Checker Flowers. I used 2 ribbons at the top of the tag- organza and seam binding. Back in town and catching up- I will be catching up on blogs in the next week. Thanks for your patience! DC was a blast.